Andrew Macleod of Emilia’s Crafted Pasta has a deep passion for pasta. Having grown up with pasta as a regular dinner staple through his childhood, Andrew often cooked it himself through university. So enamoured with pasta he took regular trips to Italy, starting with Emilia-Romana, the home of fresh pasta. Here he spent much of his time eating in local family trattorias as well as developing his own skills in making pasta through experienced pastaio. 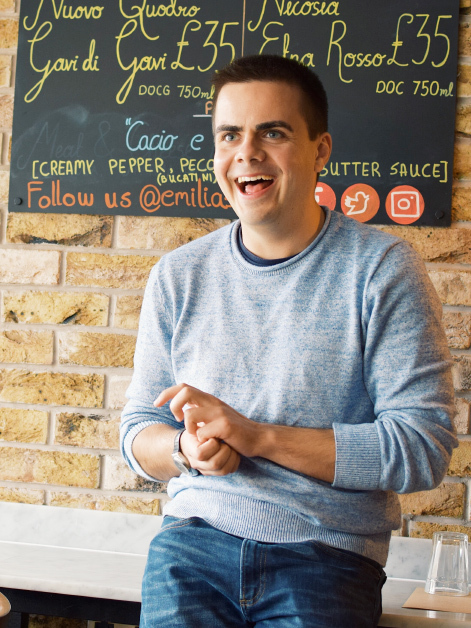 Though Andrew studied maths, once he graduated he made the decision to pursue his pasta dream and his entrepreneurial spirit guided towards opening a pasta restaurant. As a result of his travels Andrew gained an intricate knowledge of the science and craft pasta that he now showcases through Emilia’s Crafted Pasta which launched in 2016 in St Katherine Docks, and recently opened its second location in Aldgate. He wanted his restaurants to address London’s lack of quality, well-prepared pasta. In both restaurants, they make all the pasta by hand, with fresh pasta being made daily. Andrew also sources his ingredients from quality producers in both Italy and the United Kingdom, returning to Italy at least twice a year to source artisanal products such as balsamic vinegar and cured meats. Each time that Andrew visits Italy he is inspired by the trends in pasta, as well as learning more about the craft, developing his own skills which are then reflected in Emilia’s’, ensuring his restaurants are always providing the best pasta experience possible. Nothing makes me angry, but I would love to see Hospitality become a career path for more and more people. The diverse range of skills needed to run a successful restaurant are very underestimated. The UK could take example from Switzerland. I grew up on pasta, so it would have to be two big bowls of fresh pasta – probably our creamy homemade Pesto with casarecce and hearty Bechamel Bolognese with silky pappardelle. Family, football, tennis, cold water swimming (yes really!) and poker. Having a healthy and happy family around me every day to celebrate life with. Making fresh pasta restaurants commonplace. If you’d said 50 years ago that were would restaurants that only served pizzas no one would have believed you. Now there’s a Pizza Express or Franco Manca on almost every corner. I’d love to do the same for pasta. I’m not envious of anyone. I look up to Isadore Sharp and admire the culture and service level he has built at Four Seasons Hotels & Resorts. Not my style, I prefer to take life one pasta shape at a time.